TERRE HAUTE, Ind. - When John Boyd takes to the Tilson Auditorium stage April 15 it will be a bittersweet moment. In many ways, it will be like any other Indiana State University Wind Orchestra concert . In reality, it marks the end of an era. Boyd, who has spent 41 years in higher education, will retire in May after 21 years as Indiana State's director of bands. During the 7:30 p.m. performance, he will be honored by his colleagues and students. Boyd will conduct the Wind Orchestra for the last time, performing works such as Richard Strauss' "Allerseelen," Peter Tanner's "Sonata for Marimba" and Modest Mussorgsky's "Pictures at an Exhibition." ISU music faculty members Paul Bro and Jimmy Finnie will perform with the orchestra. Also performing in honor of the retiring director will be the Faculty Winds and Brass Quintet. Doug Keiser, associate director of bands, will conduct the ensemble for Ira Hearshen's "Symphony on Themes of John Phillip Sousa," which was performed by Indiana State at the 1997 Atlanta International Band and Orchestra Conference under the direction of Frederick Fennell. Boyd has guest conducted The United States Army Band twice and the United States Army Field Band; conducted/lectured three times at the Royal Northern College of Music at Manchester in the United Kingdom; and was chosen as a conductor at three WASBE International Conferences. He has also conducted at state and regional College Band Directors National Association and National Association for Music Education performances, in addition to receiving invitations to appear at four National Music Educators Conferences. Additional conducting and judging has been done in Tajimi, Japan, and with the China Youth Corps Band in Taipei, Taiwan. In 1995, he released, to rave reviews, the compact disc Capriccio with the Indiana State University Symphonic Wind Ensemble and Faculty Winds. Other releases followed: Tapestries, Wind Songs, Symphonies and Such, and Collage featuring the Indiana State University Faculty Winds; and Russian Rhapsodies, Basically British, Masterworks for Wind Band, and Fantastic Dances with the Philharmonia à Vent. An active arranger and composer of all forms of wind band music, Boyd has published works in the catalogs of C. Allen, Ludwig, G. Schirmer, Cole, Associated Music, and Warner Brothers. He released his first compact disk Ghosts with the Philharmonia à Vent on Klavier Recordings in the spring of 2005, released Laude, the music of Howard Hanson in 2006, and released Reflections in October 2007. In May 2008, Boyd conducted the wind orchestra at the Central Conservatory of Beijing in the Peoples Republic of China, and was a judge at Guangzhou for the China Trumpet Guild. He was also a clinician at the Guangzhou Conservatory where he worked with their Wind Orchestra in April 2007. Boyd also conducted the Military Band of the P.L.A. in Beijing, and the members of the wind section of the Singapore Symphony in January 2009 in a program of wind chamber music. 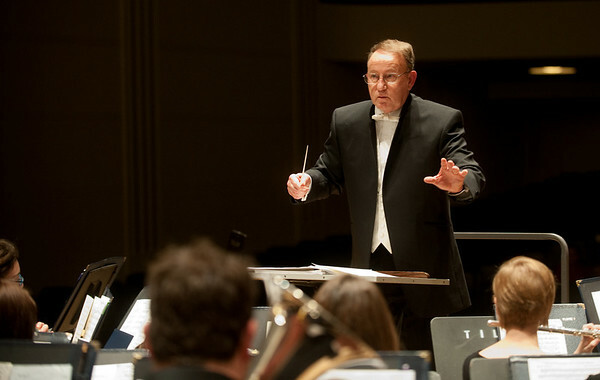 As director of bands, professor of music, and coordinator of the Wind/Percussion Division at Indiana State University, Boyd conducts the Wind Orchestra and the professional wind orchestra Philharmonia à Vent. During the 2006-2007 academic year, he was a visiting professor and the first conductor of the Conservatory Winds at Yong Siew Toh Conservatory, National University of Singapore. He also conducted the Philharmonic Winds of Singapore at the Esplandé Concert Hall. The concert is free and open to the public. A reception, hosted by the music department, will follow the concert. For more information, contact the music department at 812-237-2771. John Boyd, who has spent 41 years in higher education, will retire in May after 21 years as Indiana State's director of bands, will conduct the Wind Orchestra for the final time.